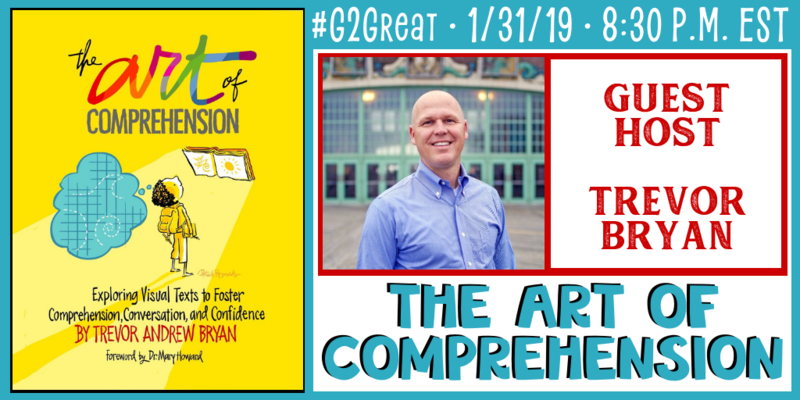 I was one of the lucky recipients of Trevor’s immense wisdom several years ago when he graciously immersed us in the Art of Comprehension (AoC) process in a step-by-step Voxer gathering of friends. From these early learning experiences, I could envision AoC coming to life in the pages of a book someday. Imagine my joy when ‘someday’ became a reality and Trevor asked me to write his foreword. The icing on the book cake was holding his beautiful book in my hands graced by a Peter H. Reynolds cover illustration. With his book beside me, I turned to Trevor-inspired chat tweets, moving back and forth between the book and chat. It didn’t take long before the gifts Trevor wrapped neatly into a thoughtful comprehension design began to come into view. 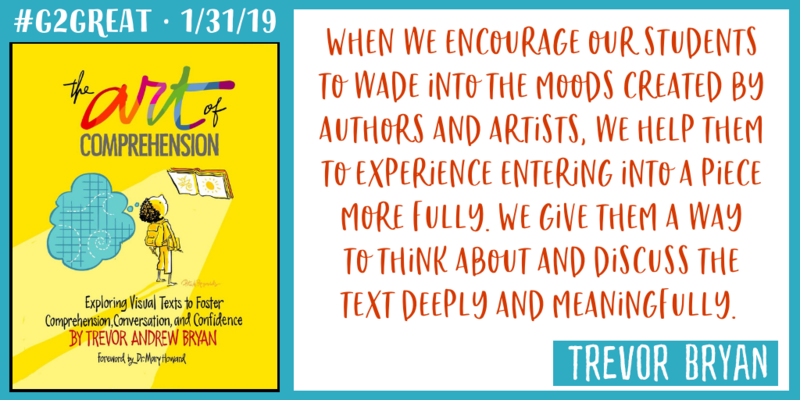 Writing a #G2Great chat reflection feels like an exploratory venture toward a sense of writerly direction and Trevor’s Five AoC Gifts felt like the perfect path for this post to travel. 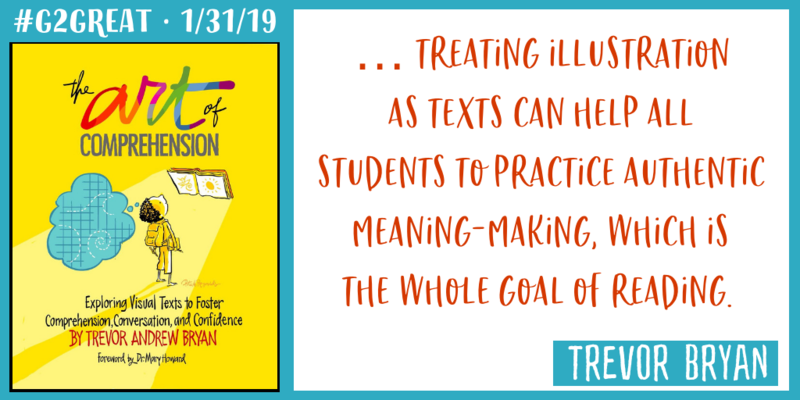 Narrowly defined views of what constitutes “text” limit our perspective as well as the possibilities for meaningfully using those texts to engage readers of all ages and stages of reading. Trevor shows us that “text” can and should embrace images including photographs, drawings, paintings, artwork, and video. Each of these can inform thinking and thus support our efforts to promote understanding. Visual literacy is certainly a central feature of the AoC process, but Trevor includes words in print within this process including thoughtful connections between images and words. Trevor asks us not to think of The Art of Comprehension as a book about visual literacy but rather as “a book about literacy with an expanded view of what constitutes text” (p 4). This broader perspective widens the repertoire of text experiences we offer children using images and print, both individually or in unison. 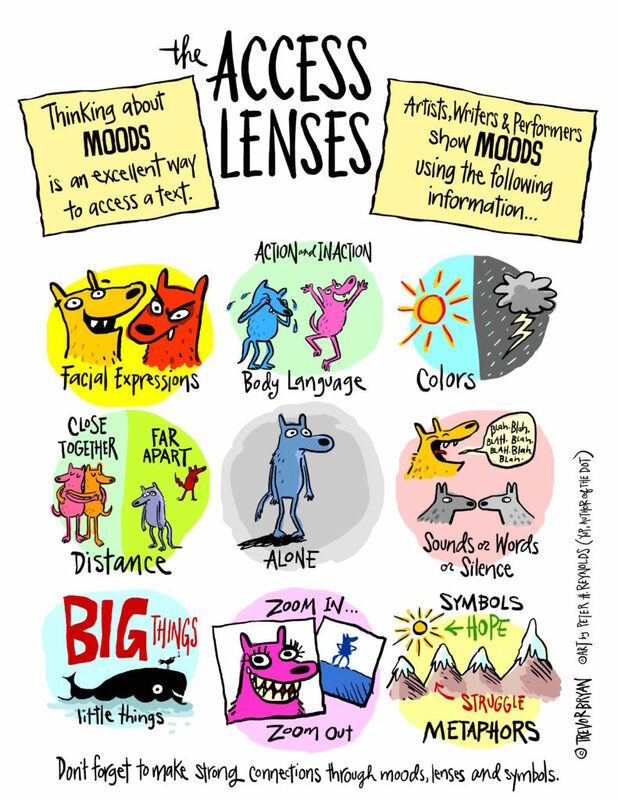 A key feature of the AoC process is the Access Lenses shown below and beautifully illustrated by Peter Reynolds (download The Access Lenses here). The Access Lenses, or what Trevor refers to as the Framework and Mood Structures, offer children a concrete visual reference designed to gently nudge thinking as students engage with images and begin learning how careful paying attention to mood can support understanding in ways that offer a visual stepping stone to meaning. This concrete tool is a reminder of the different ways that illustrators, artists and photographers help us notice and then name what we see as this noticing/naming process becomes a pathway to increasing understanding. The Access Lenses provide a temporary scaffold to think about the varied features that inform our thinking and then become talking points that deepen that thinking. The AoC process swings a comprehension door wide open so that we can invite our children to enter a supportive thinking space where all ideas are welcome. The open-ended, flexible design makes room for every child to engage in the experience with support, regardless of where they are in the reading process. Using visual texts as a springboard gives each child a seat at the thinking table where engaging, supportive dialogue beckons them as thought partners. In Trevor’s words, AoC “enables all learners, striving readers and nonreaders included, to join classroom conversations– building their confidence as well as community.” (p. 3) The comprehension framework Trevor has created readily supports high level thinking through visuals so that even children who cannot yet read the words yet can become active participants in meaningful, purposeful and yes, rigorous literacy experiences. A powerful aspect of the AoC process is the ability to use the text to ignite and support conversations but then gradually fade that support as children collaborate with peers. Teacher-supported conversations set the stage for these collaborative conversations as we step aside and allow shared dialogue to take on a life of its own. This stepping back affords time and space for teachers to listen in on conversations in order to reinforce thinking while watching for signs where stepping back in may be needed. This step in–step out support dance is designed to encourage students to share their ideas as we keep our sights on opportunities to grow independence. This is not remotely akin to the one-size-fits all question interrogations that are commonplace when basal programs lead the way. Rather it leaves room for surprises that arise from student engaged thinking with time to celebrate that thinking in the company of others in a respectful environment. Toward the end of the chat, Trevor posted the tweet below. It struck me as something so pertinent to the AoC process, and yet a point that I had never really considered before. Trevor is an art teacher who saw the arts as a way to promote and support comprehension. Having been on the receiving end of this rich process through his supportive eye, it was easy for me to see how the art world and the literacy world can collide in joyful harmony. What I love about the thinking in this tweet is that Trevor takes this one step further by reminding us that the image-print merger not only helps us to comprehend texts in ways that heighten the meaning-making process but also heighten our awareness that those texts help us to comprehend our lives for ourselves and students. I love this joining of worlds that are not as different as I had once supposed. Yet Trevor saw these connections all along. Very wise man indeed. With these gifts in mind, I asked Trevor to share his thinking about the AoC process by responding to three questions. His responses give us insight into how this book came to be. What motivated you to write this book? What impact did you hope that it would have in the professional world? I had a rich, arts life growing up. They were a big part of my childhood experience and continued to have an impact all through my college years. Twenty years ago, I decided to enter into education with the belief that the arts were being underutilized and that they could and should be playing a more prominent role in the academic lives of students. However, upon starting my career as an art educator, I quickly realized that the tools I was taught to talk about art effectively, have almost zero impact on people who did not have a rich, arts background or at least a serious interest. After ten years of searching, I realized that entering artworks using reading comprehension skills produced more effective conversations around art and also created a simple, direct way for the arts to directly impact academic development that was more easily understood by my fellow educators who did not have a rich, arts background. More Importantly, through this work, I started to realize that my approach, explained in my book, was helping all learners to explore and share their unique voices. This work created an inclusive culture where every child was able to not only participate in classroom learning but they were able to meaningfully contribute. I hope that my book helps launch joyful exploration of and meaningful conversation around the works of art, books, plays, movies and other texts that students engage with regularly. The arts help us to comprehend and share our human experience, I hope my book helps to make this clearer. What are your BIG takeaways from your book that you hope teachers will embrace in their teaching practices? I hope that educators become more aware of the various forms of texts that demand the use of comprehension skills in order to make meaning of them. I hope they see that all of the arts truly are related and that there is a tremendous amount of overlap between them. I hope they see how all of the arts help us to explore and comprehend our own lives and whether we are writing, acting, singing, painting we can practice and utilize similar communication skills. And I also hope that teachers come to see the Access Lenses, the Framework and the Mood Structures as a simple foundation on which students can construct meaning regardless of the type of text they are exploring. What is one message from the heart that you would like for every teacher to keep in mind based on your book? My message from the heart would be that the arts foster joy and connection, even when and especially when times or topics are tough. Meaningful exploration of any form of art helps us to joyfully connect to our peers, our colleagues, our families and even to ourselves. The arts helps us to comprehend our human experience and share our human experience. Seems to me that both of these should be an integral part of a meaningful education. Thank you for sharpening our view Trevor. And now, it’s time for teachers everywhere to get our hands dirty for kids!